The National Library of Medicine (NLM) had a modest beginning—a small collection of books in the library of the US Army Surgeon General in 1836. From that founding collection has sprung today’s National Library of Medicine, the world’s largest biomedical library, housing some 17 million items in more than 150 languages, including books, journals, manuscripts, audiovisuals, and other forms of medical information. To celebrate its 175th anniversary year, the Library is inaugurating a new Web site, providing further insights into NLM, past and present and its information innovation that has changed the way scientific and medical information is organized, stored, accessed, and disseminated. “The goal was a user-friendly site that would represent the Library’s many interesting facets,” notes NLM Communications Director Kathy Cravedi. “The site is an important milestone, opening our 175th year. It’s a great way to give our patrons and users worldwide a good look at who we are and what we do; to join as we celebrate this uniquely important institution.” She and Dwight Clarke, a Senior IT and Systems Researcher in NLM’s Office of Computer and Communications Systems (OCCS), led the site’s creative development team. Along with other key NLM team members, they began planning last September. The goal was to recount the NLM story, highlighting its history, global reach, huge database of information, and its many partnerships. “Coordinating and capturing everything was our toughest challenge,” observes Clarke. The new Web site features an opening welcome from Director Dr. Donald Lindberg on the mission of the NLM, as well as a brief video chronicling the Library’s history. “Our Programs and Services” features profiles of the Office of the Director (OD), the National Center for Biotechnology Information (NCBI), Extramural Programs (EP), the Office of Computer and Communications Systems (OCCS), Library Operations (LO), the Lister Hill National Center for Biomedical Communications (LHNCBC), and Specialized Information Services (SIS). Illustrated with text and images from these NLM Divisions, and links to their many resources, this part of the site informs users about the Library’s world-renowned information services, research programs, scientific discovery, clinical research, education, health care delivery, and public health response which support its mission of empowering people to improve their personal health. “Our Milestones” lists key achievements since 1836, accompanied by historical images. The Library’s historical collections are also showcased on the site, as are partnerships with the National Institutes of Health and other agencies and institutions. The “Calendar of Events” for the anniversary year will be updated frequently, as will an “Image Gallery,” featuring pictures of the Library from the past and from the various anniversary events this year. Look for a growing list of “175th Memorabilia” items, which will be on sale throughout 2011. Altogether, the team included Anne Altemus, Jenny Heiland-Luedtke, Wei Ma, Melanie Modlin, Andrew Petitti, Joseph Potvin, Jeffrey Reznick, Rochelle Robinson, and Karen Steely. They began by first determining the site’s graphic look and content, then moved on to designing and producing the 175th Anniversary logo, gathering as many NLM employees as possible to pose for the celebratory group photo outside on December 9, 2010 and obtaining final sign off for the site. Photo: 175th anniversary Web development team. 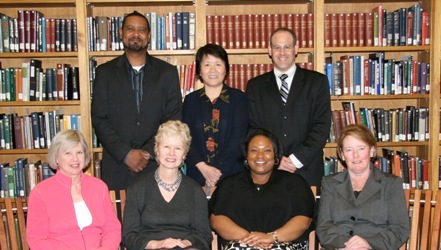 Front row (l. to r.): Karen Steely, Melanie Modlin, Rochelle Robinson, Kathy Cravedi; Back row (l. to r.): Dwight Clarke, Wei Ma, Jeff Reznick; Not pictured: Anne Altemus, Jenny Heiland-Luedtke, Andrew Petitti, Joe Potvin. Photo by: Fran Sandridge. March 15, 2011 in Events, Products.